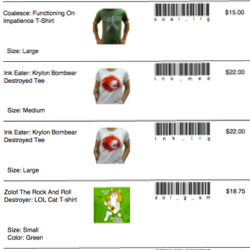 The extension features rock solid code, integrates with Magento's themes. Easily create professional Magento pdf documents with 50+ custom options, or create your own custom design by modifying the .phtml template files. Add your company logo or product images. 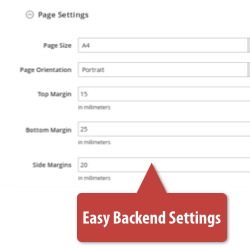 Change page margins and fonts, add custom information and more (see full list below). Add SKU barcodes for more accurate warehouse packing to save hours of time. 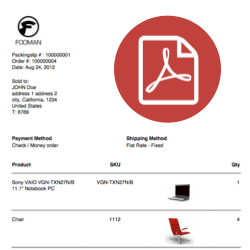 Plus, adds a new Order Confirmation pdf document type for easy order management. Existing Magento 1 Pdf Customer customers receive an exclusive discount on upgrading to this Magento 2 extension. Email us at support@fooman.co.nz and we'll hook you up! No. The Email Attachments extension will automatically be installed when installing Pdf Customiser. If you have previously installed Email Attachments, please uninstall it prior to installing Pdf Customiser. 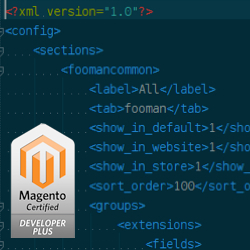 We had the original fooman on magento 1 and we were very pleased with this plugin and decided to upgrade to the magento 2 version. Fooman offer free installation, however we have not received a reply since 13th March for installation. They aim to reply with 24 hours. We have sent numerous emails since that date for an update. If we do not receive a reply, we may have to resort to contacting our credit card company to issue a refund and use another provide plugin. We are extremely disappointed with the service. A great product with even better support! Does what it says on the tin! Easy to setup & use, and excellent support. We use the Packing slips function, along with the Picking list extension, and that gives us a simple efficient workflow. We had the M1 version on our old site, we reviewed other vendors extensions when we upgraded to M2 and decided to stick with Fooman. We had a couple of minor issues but Kristof & his team sorted them out quickly, and added a couple of features we asked for. I can change around colums, sort the items of an order, add text to one or several of the footer blocks, all in a few clicks. I forgot a closing tag in a footer block which caused the module to throw an error and Kristof was happy (and very quick) to help. We integrated the extensions into magento 2.2.4 without problems.